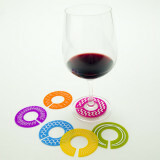 "The reusable cap for a wine or champagne bottle"
CapaBunga® is a reusable silicone cap that reseals a bottle of wine after you remove the cork. It's made to resemble the bungs used to seal barrels during winemaking. 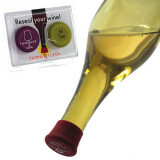 Once you remove the cork and re-seal the bottle with a CapaBunga®, it is liquid tight and the bottle can rest on its side or even upside down without leaking. No more jamming the cork back in the bottle, no more rearranging the fridge to fit an open bottle in the door. The open bottle can also be stored on it's side in the fridge or on a wine rack. 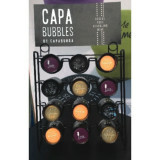 CapaBunga® fits virtually every wine bottle.